Daily trading volume for the world’s largest cryptocurrency bitcoin exceeded $11 billion Friday, the most observed in a 24-hour period since April 25 of last year. At that time, the average price of bitcoin was $8,845, while today the crypto asset is listed for less than half the price, currently trading at $3,951 as per CoinMarketCap. However, the return in volume is potentially a sign investors aren’t losing interest in bitcoin despite the less than favorable market conditions. 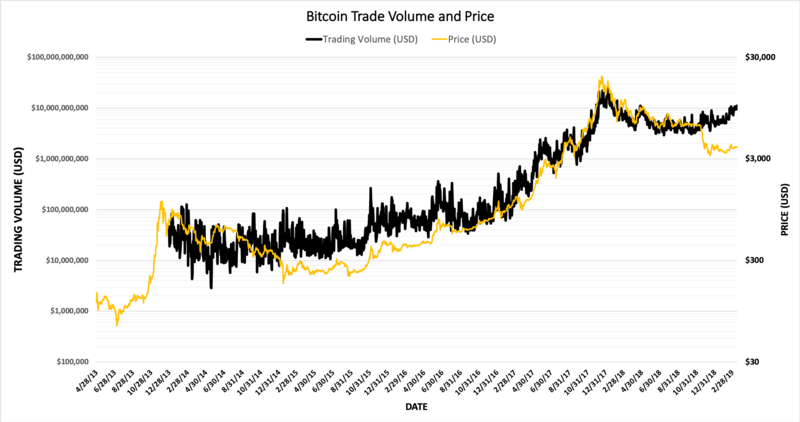 Interestingly, the amount of bitcoin trade volume had closely aligned with it’s price trend for years, but upon closer examination, the close connection ended during the latest market rout in November when trade volumes failed to sink along with the quickly depreciating broader cryptocurrency market. As can be seen below, the divergence between trading volume is evident for not only bitcoin, but other top-ranked cryptocurrencies like the fourth-largest in the world by market cap, litecoin (LTC). Just before the plunge to $3,000, bitcoin was priced at $6,385 on Nov. 10 when it accumulated $3.70 billion in 24-hour exchange volume, according to data from Coinmarketcap. Today, however, bitcoin’s price is nearly half of what it was in November, yet its trading volume is just above $11 billion, which is 200 percent more than the trading volume seen on Nov. 10 and a value last commonly observed in April 2018. Coinmarketcap data further reveals the most exchange volume the world’s largest cryptocurrency ever saw in a single day was $23.84 billion when bitcoin’s price was $17,429.50 on Jan. 05, 2018. 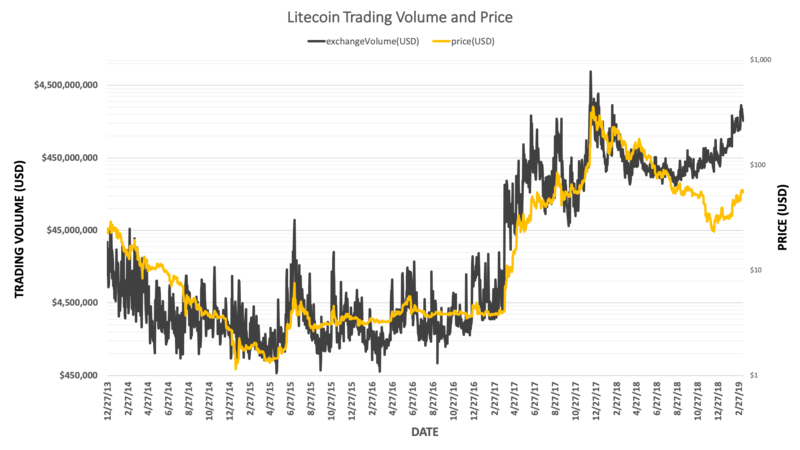 Litecoin’s exchange volume is following a similar trajectory as bitcoin’s exchange volume. As can be seen above, exchange volume began to deviate from litecoin’s price trend around November once again, when the cryptocurrency was trading in the $50 dollar range and exchange volume figures spanned from roughly $300 million to just over $600 million, according to data from Coinmetrics. Litecoin’s is now trading at $58 and its 24-hour exchange volume registers $1.79 billion – again, more than double the values frequently observed before the cryptocurrency plunged below $30 in November. The slight difference between litecoin and bitcoin’s trading volume and price relationship is that litecoin’s price has increased over 100 percent since its December low along with the rise in exchange volume, while bitcoin has seen a more seldom 20 percent increase from its low.